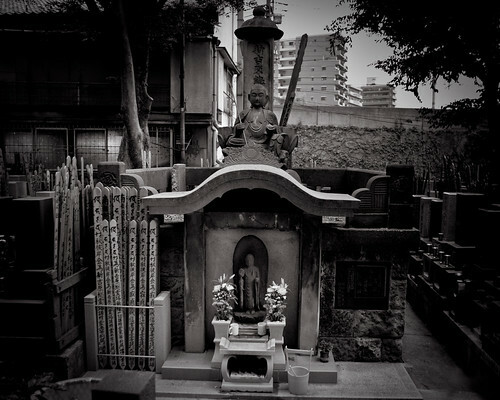 Some 25,000 Yoshiwara prostitutes are interred at Jokanji temple. It is also known as Nagekomi-dera, literally "throwing-in" or "throw-away" temple, because the bodies of the women were simply dumped outside the gate and buried anonymously. This very well-done article explains it in detail. Larger versions of the article photos are here. Photo above links to a very large version. Note the kanzashi affixed under the roof of the small shrine. This site and this site also have info and photos. Thats such a sad story. and a well written article. I have never heard of the prostitute quarters in yoshiwara. as sad as it is even more so that it still goes on in all parts of the world even today. It was nice they put the hira-kanzashi on their monument. sorta puts a human face on all the ashes inside. I'll have to dig my Yoshiwara book up, but i can add one point: the reason it is mentioned they "wouldn't survive up to 30" might be because all Yoshiwara prostitutes were thrown out at 28, so indeed there wouldn't be many 30-years-old yujô there. They would do all they could to attach themselves a man before that deadline (haha) and the highest ranking ones had no difficulty to do so. The low-class, unlucky ones became hinin, sub-human trash, who often continued their business in other illegal areas. One who was too afraid of the outside world might also stay in as a yaritebaba, an old and bitter janitor who made sure the clients kept in line. Also, the women working there didn't have a "debt" to pay off, they were merchandise if bought as little girls, or had to stay in the whole of their sentence time, for those who were brought there for having committed the crime of... prostitution! (Illegally: the crime actually was that they weren't bringing tax money to the government from their activity.) I guess the author made the amalgam with those little girl who were sold as well, but into the geisha profession. My apologies for reviving an old thread but it was suggested below and I had info to add. Recently, I was reading on a CNN website and it had mentioned Jyokanji and Yoshiwara. In the past of that area was sad times in my opinion, women being used simply for being women. Anyway, my historical interests made me ask what had happen to Yoshiwara and thus I came across this website. Also mentioned in the article is someone who keeps a blog and photographs Yoshiwara now. The site is in Japanese.